The Outdoor Activity Sheet is a great way to get out this summer. You can plan ahead with every aspect of your outdoor excursion by downloading this free template today. 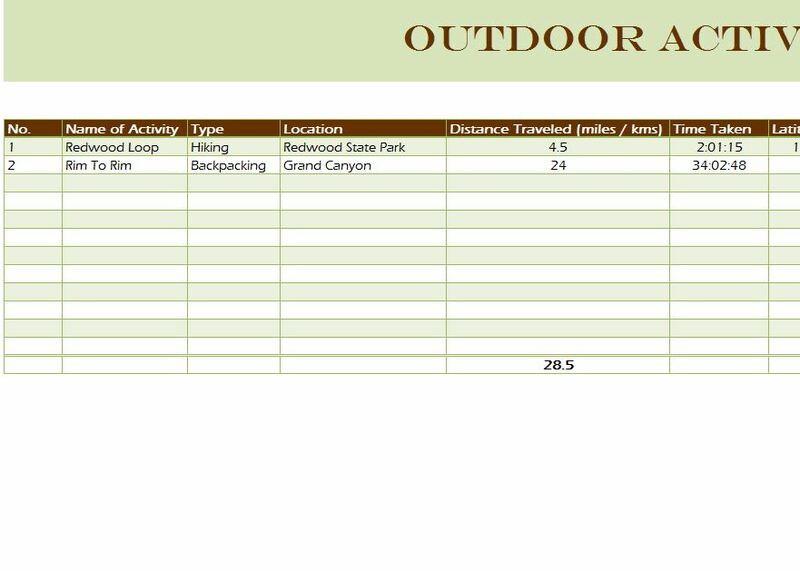 Any activity from hiking to biking can be detailed with precision using this template so you never have a wasted minute. This template ensures that you have everything you need to take charge this summer and master the outdoors. To learn more about this free template just read the instructions provided for you below. You will need to start by downloading the template. To do this, just click the link at the bottom of this page and the template file will start downloading directly to your computer. Start by going to the “Activity Type” tab at the bottom of the page. You can enter your categories here, to make organizing the template much easier on the main tab. You can see a few examples in the template already. To change any of the pre-written examples, just click inside the cell and write something new in its place. The “Activity Detail” tab is where all the action happens. First, enter a number corresponding to the actions you want to take on your outdoor trip, the name of the activity, and the type (use categories from earlier tab), the distance you will travel. You can enter the time it took you and other information that you may need if you are hiking a long distance. However, the remaining columns are completely optional. You will make your way through the list of items you created beforehand so there will never be an unspent moment on your trip. The template will even take the distance you enter and add them together to show off the impressive physical feats you’ve just achieved.